ArtPrize HUB/HQ, seven new Neighborhood HUBs and the ArtPrize Clubhouse will inspire, inform and reward visitors looking to explore the world’s largest art competition. GRAND RAPIDS, Michigan (AUGUST 10, 2016) -- ArtPrize, the radically open international art competition decided equally by public vote and expert jury, today revealed plans to expand the core visitor services found at the ArtPrize HUB/HQ with the addition of seven new Neighborhood HUBs located at anchor venues across the ArtPrize district. The HUBs are ArtPrize-operated service locations at eight major venues, including the original ArtPrize HUB/HQ at 41 Sheldon Blvd., and serve as welcome centers, voter registration locations and guideposts for visitors looking for real-time information on the venues and events specific to each HUB’s neighborhood. 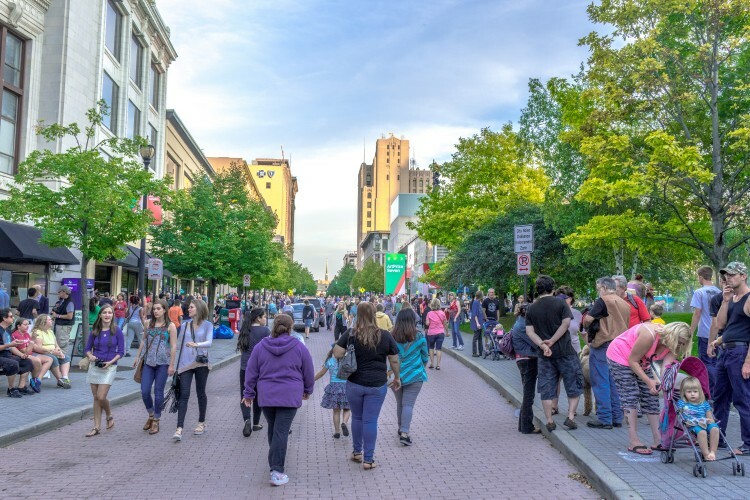 All ArtPrize HUBs will be welcome and information centers where visitors can pick up event guides and maps, receive a commemorative tote provided by Meijer for the first 20,000 visitors, and be quickly registered to vote. All HUBs will offer ArtPrize retail including the 19-day Metro Pass and select items from the newly revealed ArtPrize Eight Commemorative apparel. With each HUB having services and information specific to the neighborhoods they serve, visitors are encouraged to visit all eight HUBs and collect stamps for the ArtPrize Eight Passport Program and Contest. Also new for ArtPrize Eight is a highrise location for this year’s Clubhouse -- a lounge exclusive to ArtPrize Artists, Venue Representatives, Sponsors, and members of the ArtFan and ArtClub programs. The Clubhouse is presented by Wolverine Worldwide. Located at 41 Sheldon Blvd, the ArtPrize HUB and ArtPrize Headquarters (HUB/HQ) presented by Steelcase serves as the model for each neighborhood HUB -- as a welcome center, voter registration location, and the flagship ArtPrize retail space. In addition to hosting all Critical Discourse programming -- six evenings of panel discussions and art critique presented by ITC, Your Energy Superhighway -- the ArtPrize HUB/HQ will also house the recently announced STEAM Village powered by Switch, a cutting-edge technology experience with interactive activities for kids and families. The STEAM Village will transform the ArtPrize HUB/HQ soundstage into an immersive learning lab, featuring Switch-funded Planet3 and Code.org software demonstrations, a virtual reality painting experience, tinkering stations, Northwood Awakening -- a stunning combination of photography and textile that captured visitors’ imaginations and the $200,000 Public Vote Grand Prize in 2015 -- as well as video of Kate Gilmore’s $200,000 Juried Grand Prize winning installation Higher Ground. Welcoming visitors to the HUB/HQ will be a lush and playful Pop-Up Park designed and built by Landscape Design Services. Located outside the ArtPrize HUB/HQ, the temporary green space will host a variety of daily education programming, including scavenger hunts and after-school activities. Every Saturday, the Pop-Up Park will house ArtPrize Labs events featuring creative activities for people of all ages. New for the eighth annual event, ArtPrize visitors will find eight Neighborhood HUBs throughout the ArtPrize district. These HUBs will function as ArtPrize-operated visitor service locations at eight major venues including the original ArtPrize HUB/HQ at 41 Sheldon Blvd. Designed to meet visitor needs, the HUBs serve first as an entry point to the event. Every HUB location will provide visitors with the opportunity to register to vote -- courtesy of Trivalent Group -- and pick up an event guide and map, as well as inform visitors about neighborhood-specific tours and events, give ArtPrize mobile app support, and offer ArtPrize Eight Merchandise and Metro Passes. In addition to real-time information on the venues and events specific to each HUB’s neighborhood, the first 20,000 visitors to any ArtPrize HUB will receive a commemorative tote provided by Meijer. Each of the eight ArtPrize Neighborhood HUBs services a distinct area of the ArtPrize district. Visitors are encouraged to visit them all to learn more about the walking paths, events and featured venues in each HUB’s service area -- and to get their ArtPrize Passports stamped. Visitors who collect stamps from any five of the eight HUBs will be entered to win prizes from ArtPrize and Founders Brewing Co. Those who collect stamps from all eight Neighborhood HUBs as well as the exclusive ArtPrize Medallion sticker -- available only at the Founders Brewing Co. tent at the ArtPrize Awards public viewing party at Rosa Parks Circle -- will be entered to win a grand prize package from ArtPrize and Founders Brewing Co. The ArtPrize HUB/HQ will once again serve as the event’s flagship store, featuring the full 2016 ArtPrize retail line -- designed in collaboration with Conduit Studio. Colors and prints not only reflect the ArtPrize Eight theme, but also include unique Michigan and Grand Rapids-inspired items that correspond to the ArtPrize Eight design aesthetic. The merchandise explores these combinations in various patterns, colors and arrangements providing items as distinct and original as each visitor’s ArtPrize experience.The retail line features sweatshirts, long and short sleeve t-shirts, hats and beanies, and is available in sizes ranging from XS to XXL, as well as youth sizes. The retail line will also feature great gift ideas like pint glasses, coffee mugs, notebooks, Pantone items and a custom-made ArtPrize Eight deck of cards. The ArtPrize HUB/HQ will open to the public on September 14, at the start of ArtPrize Preview Week -- and will remain open throughout the event from 11 a.m.-8 p.m. Monday through Saturday, and 11 a.m.-6 p.m. on Sundays. The full Critical Discourse lineup of events will be announced soon. The ArtPrize Clubhouse, presented by Wolverine Worldwide, is a designated area for ArtClub and ArtFan members, as well as credentialed Artists, Venues, Sponsors and media to relax, meet and mingle. Located on the seventh floor of 50 Louis NW, the ArtPrize Clubhouse guarantees badgeholders a quiet space away from the bustle of the event -- with a relaxing atmosphere, developed by Via Design Inc., ideally situated in the heart of the ArtPrize district. Between 4–6 p.m. guests are invited to enjoy happy hour drinks as well as refreshments -- with complimentary coffee courtesy of Ferris Coffee & Nut available every morning. The ArtPrize Clubhouse will be open from 11 a.m.-7 p.m. throughout the event, including ArtPrize Preview Week. ArtPrize Eight will take place in downtown Grand Rapids from September 21-October 9, 2016 -- when everyone is invited to voice their opinions on contemporary art and select the winners of $500,000 in cash prizes.